Inter-annual evolution in the "Oil refining" and "Electrical energy, gas and water" sectors greatly influenced the performance of the General Production Index. 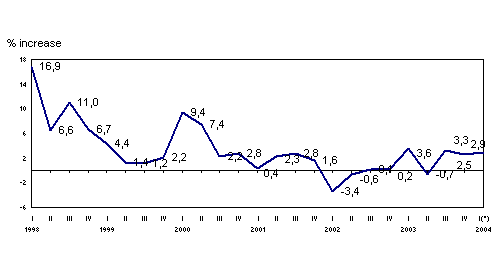 Industrial production in February 2004 in the A.C. of the Basque Country grew 4.6% in relation to the same month of 2003 in absolute terms, according to EUSTAT data. In homogenous terms of the working calendar, the inter-annual variation was 2.2%, since February 2004 had one day more than in 2003. Accumulated growth for the first two months of the year came to 2.9% in relation to last year. The most positive inter-annual variations, in absolute terms, for February 2004 corresponded to the sectors of "Oil refining" (100.3%), "Electric energy, gas and water" (17.7%), "Rubber and plastic" (7.5%), "Metal and non-metal minerals" (4.8%) and "Transport material" (4.7%). On the other hand, the sectors to suffer the most negative inter-annual rates were "Leather and footwear industry" (-15.8%), "Food industry” (-8.9%), "Other manufactured" (-8.5%) and "Electric material" (-1.8%). For the first two months of the year as a whole (January-February 2004 over January-February 2003), the highest growth rates corresponded to "Oil refining" (38.2%), "Electric energy, gas and water" (24.4%), "Rubber and plastic" (4.8%) and "Metallurgy and metal articles” (3.5%). On the other hand, the most negative bi-monthly rates affected the "Leather and footwear industry" (-14.6%), "Metal and non-metal minerals" (-9.7%), "Food industry" (-8.7%), "Other manufactures" (-8.7%) and "Non-metal industry" (-5,2%). According to the new classification of goods by economic destination, there was a considerable increase in February 2004 in the inter-annual rate for Energy (31.7%) and a more modest one for Intermediate Goods (4.9%). Capital Goods also rose, albeit only slightly (0.9%), but there was an overall fall for Consumer Goods (-5.4%), both in its Consumer Durables component (-6.9%) and its Consumer Non-Durables part (-4.6%), in all cases in relation to data for February 2003. By province, the inter-annual evolution of the General Index followed differing rhythms, growing, in absolute terms, 7.2% in Bizkaia, 5.1% in Alava and lastly, 1.4% in Gipuzkoa. Over the first two months of 2004, the highest accumulated growth rate corresponded to Alava and Gipuzkoa, with 3.2% in both cases, while Bizkaia obtained a somewhat lesser rate of 2.4% over the same period. The Index for February 2004 was created with the new base 2000 and linked to the previous base 1995. This change of base has meant, among other improvements, updating the representative panel of informing Companies and also products made by the industrial sector of the A.C. of the Basque Country, making an appreciable increase in number and thus coverage. The new base 2000 series has been linked with the previous base 1995 one so that analysts can follow, uninterruptedly, the monthly data of this index from January 1995 onwards. Additionally, the new classification of goods by economic destination is incorporated for the first time, in keeping with EC regulation nº 586/2001 of the Commission of the European Communities.